Avoid areas with wind-deposited snow. 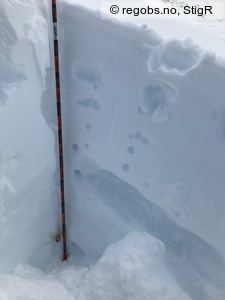 It is also possible to trigger avalanches in a persistant weak layer in old snow, typically found in bowls and gullies where the snow cover is thin. 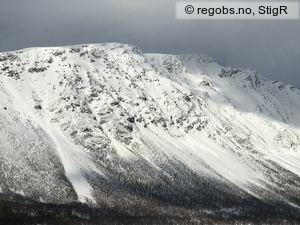 Avoid terrain traps and steep slopes until the new snow has stabilized. 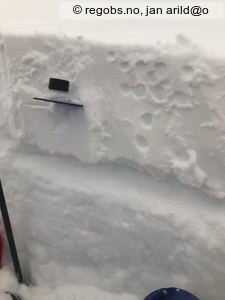 The avalanche problem is generally widely distributed on any steep slope with deep new snow. Look for cohesive new snow that breaks apart or is poorly bonded to the old snow. Cracks around your skis are a typical dangersign. 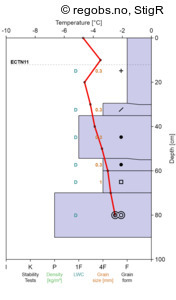 Avoid skiing in avalanche terrain (steep terrain more than 30 degrees and in runout zones). NB, remote triggering is likely. Make very conservative route choices, especially in unknown terrain, after snowfall and if temperatures rise. Identifying areas where the weak layer is present might be difficult and requires experience. 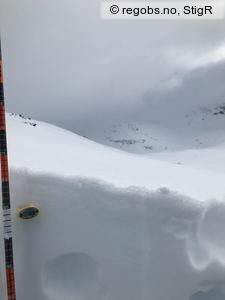 Danger signs are whoumpf-sounds, cracking and recent avalanches. However, absence of signs does not mean it is safe. 5 mm precipitation, up to 12 mm in the most exposed areas. -12 °C to -6 °C at 1100 m a.s.l. Breeze from northwest., change to fresh breeze from the south during the evening. -14 °C to -8 °C at 1100 m a.s.l. • Recent avalanches • Område: I denne fjellsiden. Beskrivelse: Naturlig utløste løssnøskred. 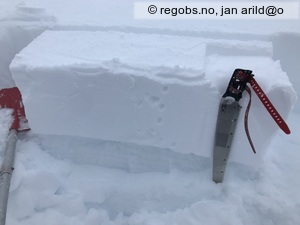 • 215 cm in total • 20 cm new snow • Elevation of new snow 0 masl • Much loose snow (10-30cm) • Dry • Mye nysnø er kommet siste døgn. Under tregrense er det ca 30-40 cm tørr løssnø som er upåvirket av vind. Under løssnø, uten særlig lagdeling, er det utviklet kantkorn. • Snow • -5.3 °C • 2 m/s from E ← • 75% clouds • Varierende skydekke med bygevær. • Snow • -2 °C • Arnøya (0moh) kl 06:00 25 cm nysnø akkumulert siste døgn. Snøfokk siste døgn. • No precipitation • 5 °C • Arnøya (0moh) kl 07:00 0 cm nysnø akkumulert siste døgn. • Snow • 5 °C • Arnøya (0moh) kl 07:00 3 cm nysnø akkumulert siste døgn. Snøfokk siste 12 timer.